Dentures in Tulsa are a popular tooth replacement option because they can enable even individuals who have lost all or most of their teeth to regain a complete smile. Dr. Nauman has helped many patients to discover the benefits of this tried and true tooth replacement method. If you would like to find out whether dentures are a fit for your circumstances, don’t hesitate to contact our office to schedule your consultation. A full denture replaces either all of the upper or lower teeth. Traditionally, this type of prosthesis has a gum-colored base that is secured in the mouth via natural suction or with the help of a dental adhesive. The teeth portion of a denture may be made of either acrylic or porcelain, both of which closely resemble the look of natural teeth. An implant-retained denture also replaces an entire arch of teeth. However, it gains its support from small titanium posts that are placed within the jawbone. This enables the denture to be as strong and sturdy as possible. The implants can even prevent bone deterioration in the jaw and help to preserve the natural shape of your face. A partial denture replaces a number of teeth throughout the mouth. It may need clips or other attachments to help it stay in place. The type of denture that is best for you depends largely on your oral health and your budget. 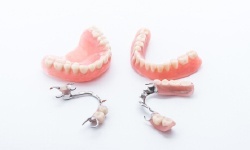 Traditional full and partial dentures can provide you with a sturdy bite and beautiful smile, and they are one of the most affordable tooth replacement options. However, they come with a few distinct disadvantages. For example, due to changes in the shape of your jaw, you’ll find that you need to replace your dentures every five to eight years or so in order to maintain a secure fit. Dr. Nauman often recommends implant-retained dentures for patients who have fair oral and overall health and who have a strong jawbone. Although this treatment costs more than traditional dentures, it is a worthwhile investment because it has the potential to last a lifetime. The strong bite and bone health benefits that implants offer provide even more reasons for you to give them some serious consideration before you make your final treatment decision. 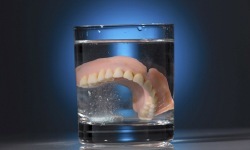 Keep your dentures clean. Brushing your prosthetic teeth can remove plaque and staining substances from them, thereby preventing odors and discoloration. Take steps to avoid breaking your denture. When you take your denture out of your mouth to clean it, do so over a folded town or a bowl of water so it will have a soft landing if you accidentally drop it. You should also be careful not to chew on anything too hard (like ice) that might damage your new teeth. Keep your dentures moist. If you have a removable prosthesis, keeping it moist when you are not wearing it will help it to maintain its shape. Place it in water or a denture-soaking solution at night. Visit your dentist regularly. Your dentist can periodically adjust the fit of your dentures, check your gum health, and provide you with tips on how to get the most out of your new teeth.